Books are the best. I love giving friends and family good books, and it’s a joy to receive books in return. But sometimes it’s hard to find just the right book to give. For instance, it can be problematic to give a book about time management to a family member who needs a little help in that area. Your not-so-subtle hint might not be as well-received as you hope (trust me, I speak from experience). Finding the perfect book can be tough. This past year, I’ve read lots of biographies of Christian men and women from various backgrounds and life experiences. I want to suggest a few that might be encouraging or helpful. These are all well-written, and some are particularly exciting page-turners. Maybe you’ll find the right book for someone on your list. Through Sunday, Amazon has a deal for $5 off a $20 book purchase (can be a combination of a few different books, or one totaling at least $20). Use code NOVBOOK18. And for another great book deal, check out this link on how to get Real and two other Good Book Company titles at a deep discount during November. 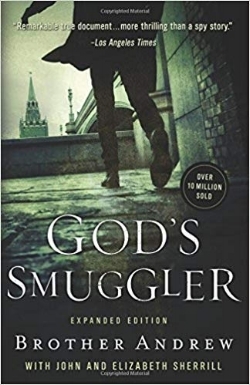 God’s Smuggler - this best-seller tells of the life of Brother Andrew, who smuggled Bibles behind the Iron Curtain. It’s exciting, at times almost unbelievable, and a great encouragement in the Christian walk. My husband and I both recently read it, and neither of us could put it down. The Hiding Place - this is a Top 5 book for me, and if you’ve never read it, just go ahead and buy yourself an early Christmas present. The story of a family living in Holland during WWII and their efforts to save Jews is incredibly inspiring and honest. The Hiding Place - Young Reader’s Edition - I accidentally ordered this version earlier this year, thinking it was the original. So I gave it to my 10-year-old daughter, who devoured it in two days and now says it’s her favorite book of all time. For the Glory: The Untold and Inspiring Story of Eric Liddell - this was one of the best written biographies I read all year. If you’ve seen the movie, “Chariots of Fire,” then you’re familiar with Liddell’s story. But the real story comes after his Olympic victory, as he moves to China and suffers greatly in love for the Chinese people. If I Perish - another WWII story, but this time taking place in Japanese-occupied Korea. This is the story of a young woman who stood up for her faith and suffered because of it, but also had a front-row seat to God doing amazing and miraculous things. Jackie Robinson: A Spiritual Biography - this book goes deep into the faith of Robinson and his family, and how it was that faith that enabled him to stand up and stay the course under intense persecution in his efforts to break baseball’s color barrier. Joni: An Unforgettable Story - Joni Eareckson Tada’s autobiography is honest and heart-wrenching, but also filled with hope. It’s great for young teens and adults. Shadow of the Almighty - a compilation of the letters and journals of missionary and martyr Jim Elliot, written by his wife, Elisabeth. For those who know of Elliot’s death at the hands of a tribe in Ecuador, this book provides the background to why Elliot was there and how God had prepared him for that sacrifice. Let me know if you’ve read any of these and what you thought!